First of all thank you all for the super useful feedback you gave me. I didn’t count on this activity and it feels really great. Since you guys brought up so many good points and I also found some interesting stuff to talk about, it was clear that I had to write this follow up article. In this article I will write about loosing titles and the Black Hand. 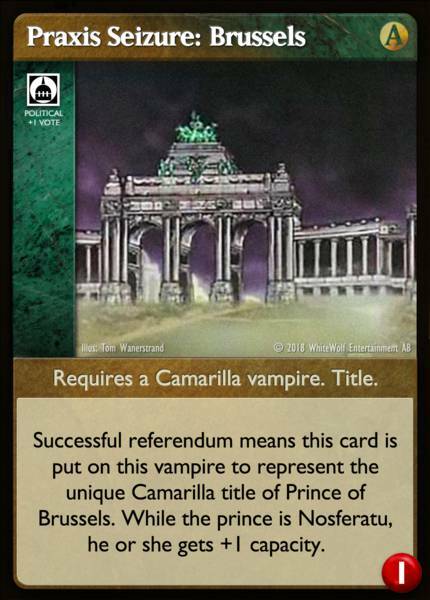 Originally I wanted to write about cards that provide votes without being or adding a title, like Legendary Vampire or Kduva’s Mask, but I decided against that. I will leave that to the future together with all sort of action modifiers and other stuff that has to do with political actions. Well if vampires can gain titles, there should be a way they can loose them. The obvious way is to yield contest, but there are some more. The first I want to talk about is the card Blood Siege. I love this card for its flavor. 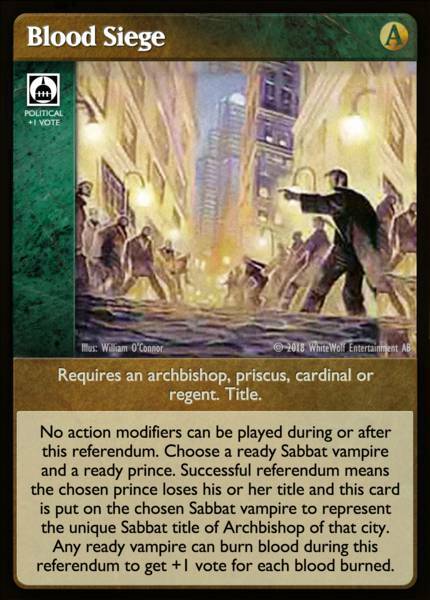 Instead of quoting what the card does let me just say it will make a Prince loose his/her title and will make a chosen Sabbat vampire an Archbishop. 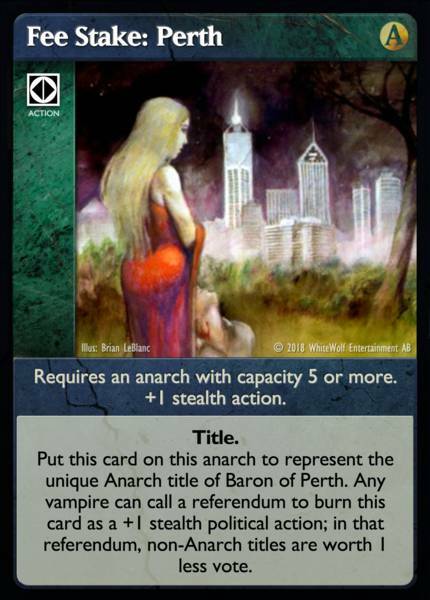 The anarchs have the card Patsy, which requires a Baron and will strip a non-Anarch vampire of his/her title and make his/her controller loose 2 pool. Cards like these seem extremely fun to play, but you will rarely see these in competitive play as they are too situational to justify the slot. Excommunication will strip an Archbishop of his/her title, similar to this Command of the Harpies will do the same to a Prince. Wrath of the Inner Circle will make a Justicar loose his/her title as well as reducing his/her capacaity by 1. Inquisition will strip one or more bishops of their title and deal 2 unpreventable damage to them. No Confidence is a funny card, being an action modifier you can play after a successful action requiring an anarch. Two copies of these will make a vampire loose benefit of his/her title. 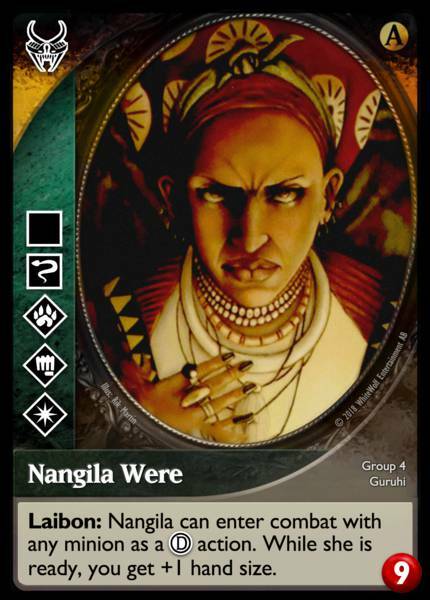 Framing an Ancient Grudge could actually be interesting in some hipster Ventrue antitribu vote/bleed deck. It is a mastercard that strips a primogen, Prince, or for 3 pool a Justicar of his/her title. I hardly remember to have played on any tournament without at least one deck /table utilizing Second Tradition and/or Parity Shift. Gustav Mallenhous can remove a bishop’s or archbishop’s title as a D action (interesting that it reads „archbishop’s” instead of „Archbishop’s”). The Black Hand has its own cool cards that need to get mentioned. Remember when I said „Anarchs are the only ones getting their titles through an action and that sets them apart.” Praetorian Backer is an exception to that. Requiring a Seraph is a very strong limitation, but the ability to make a vampire a Cardinal through an action is pretty strong. So strong that the card was made unique. Another action card requiring a Seraph is Emergency Powers. 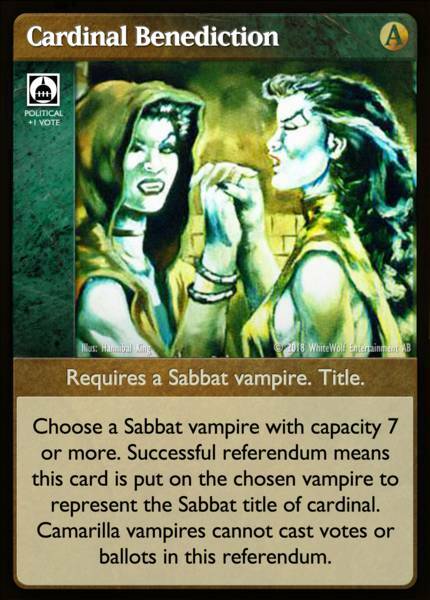 The card is put on the acting Seraph and provides +1 vote for each Gehenna card in play. The third one that needs to get mentioned is Black Hand Emissary. It also requires a Seraph. The card will be put on a ready Black Hand vampire and will provide him/her +1 vote for each ready Black Hand Vampire you control. Census Taker is a really powerful master card than can either give +1 bleed, +2 votes or +1 intercept when locked, making it a must have addition in any Black Hand themed deck. 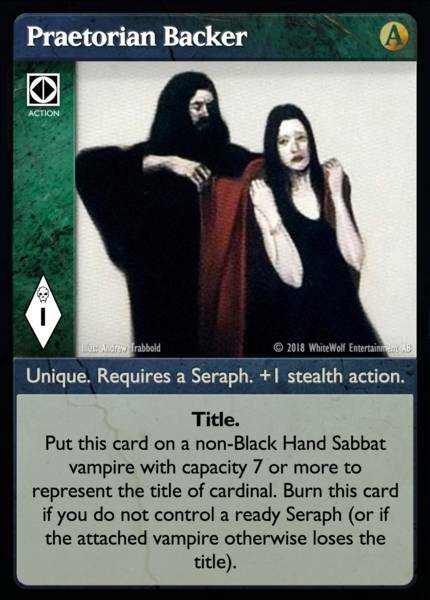 Let us assume that you have a Seraph, 2 other Black Hand vampires, one non-Black Hand Sabbat vampire with capacity above 6, a Census Taker, as well as 3 Gehenna cards in play. These three cards will add up to 3 (a cardinal) + 3 (for 3x times Black Hand) + 2 (Census Taker) + 3 (for the 3 Gehenna cards) = 11 votes. As there are many weenie Black Hand vampires and plenty of 7 cap Seraph’s (or even a 5 cap) this is not hard to achieve. While this concept is certainly not „Tier 1” it is definitely worth giving it some thought and play. 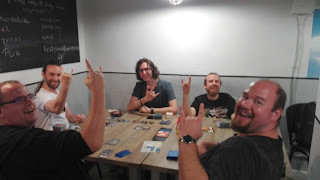 Should you ever find yourself in the situation where you don't know what to play that night, do me the favor and build a Black Hand vote deck. Feedback on results would be appreciated. This card gets an honorable mention. 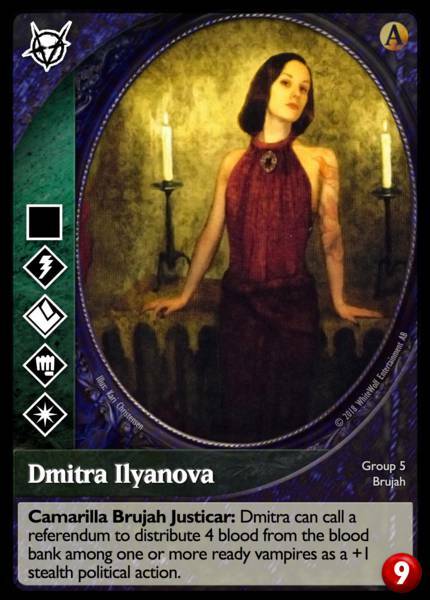 I chatted with Orpheus and he mentioned this card. I remember that I spent quite some time trying to build a deck around this, but always gave up when I realized I can't fit all I want into 90 cards. Maybe one day I'll get something done with this. 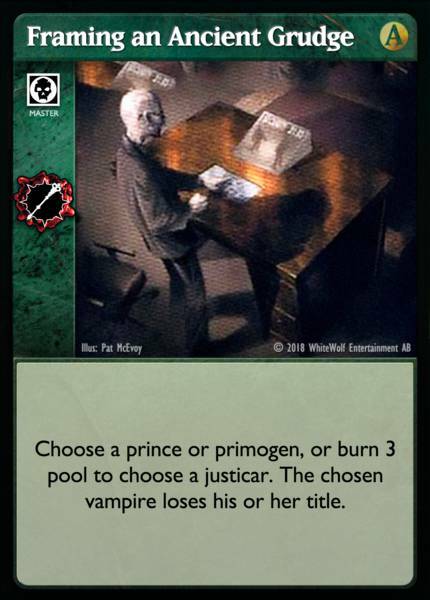 It requires you to successfully place this card on a ready vampire as a +1 stealth D action, then you need to attack it with another action and if you manage to burn or send the vampire to torpor you finally get x votes, where x is equal to that vampires votes. Unreliable, but so tempting. Thank you for reading and as always comments and feedback is much appreciated. I don't have anything carved in stone yet for my next article, but I would like to explore the world of the anarchs a bit, so don't be surprised to read something about them in the future. Although the next post might be of something entirely else. This is really just a quick and dirty style post I wrote in a few minutes. I just arrived back home from playing v:tes. Seems like Wednesday has become the regular game night again like in the good old days. We had 9 players tonight so we could play two tables. Appreciate the small milestones of a game waking up with the evenings freshness. I played a '94 style deck with Lucian, but unlike the majority of players played it, I don't use Madness Network nor do I have a malkavian only crypt. My concept is based on playing 4x Lucian and 2 copies of the following princes: Gilbert Duane, Greger Anderssen, Murat and Nikolaus Vermeulen. My deck is a bit less bleed focused and has a bit more vote cards. The main idea is that once Lucian is out each Govern superior means a new Prince in play. I don't want to tell more about it for now, let's just say it worked fine, but requires a bit fine tuning here and there. Stay tuned for more as I will post the follow up article regarding titles this week! Since I announced my return to v:tes and the revival of my blog quite some time passed. While not much happened on this blog at least part of that announcement became true. I did play several times. 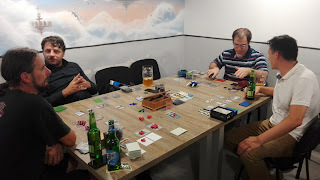 Not only with friends just for fun, but I also attended another tournament (sorry, I was too lazy to write a report). So far all the decks I played where some kind of reworks, or even exactly the same, than what I played in the good old days. Some of you already know that my biggest (and eternal) struggle (yes, this terrible pun was intended, I rate 5/7) is deck building. First of all I hate net decking. In the few occasions I do so, I mostly heavily regret it afterwards. My goal is not to create something the world has never seen before, nor to be some stylish hipster or what not. I often ended up with decks you could find a lot of on online sources. I rather feel like I have more fun when I actually build my own from scratch, because I end up with something I actually want to play. Also for me building a deck involves playing it alone over and over again. Shuffle, draw, simulate scenarios. Test the "flow" of the deck. Adjust. Remove 1-2 her, add 1-2 there. Rinse and repeat. Over and over again. Doing this gives me a feel for the deck. I find this very important. Now let's finally jump to what I wanted this post to actually be about. Since I currently have no interest in playing wall decks, well guess what, I want to build active decks. Dang. What do all active decks have in common? Yep. They make actions. Never saw that coming, huh? Maybe it is because I am a poor deck builder or just RNJesus is not on my side, but when building and playing active decks I used to find myself quite often in the situation where I couldn't really take meaningful actions, because my hand got stuck with action modifiers or combat cards or what not. That's how I came to appreciate having a crypt with a star vampire or even better with vampires, that have built in actions. So that even with a bad draw you still have at least one meaningful action to do, to maybe force a block attempt so you can cycle some action modifiers or combat cards (if that built in action is a rush), helping your deck to get the flow going, or just for the result of the action itself, helping you out while you discard and hope for something useful to pop up. I get it. Nothing new. Still she has to be on this list, because of the endless variety you can build around her. From Alastor control to Stealth vote to multi action vote/bleed to bloat/breed Brujahs with boon, to "only" being a strong support besides a star like Lutz von Hohenzollern, she can do it all. 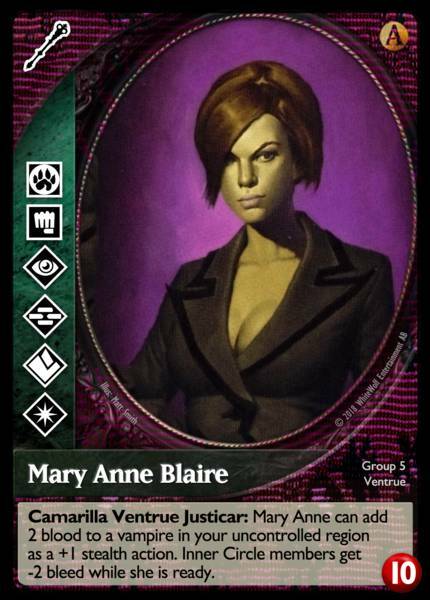 You can cycle tons of action modifiers on her, like any vote increases, freak drives, forced marches and voters and she provides a great engine for your deck, while also being able to bribe some players. Being a Ventrue you really want to build around the classic Majesty + Freak Drive engine and just overwhelm your enemies with the sheer amount of actions you take. Having a built in bloat mechanic is maybe the best you could ask for. Bloat means more vampires means more actions, but getting this action blocked means you just forced an intercept and/or wake card that could have blocked your Govern or Parity or Mind Numb or... you get it. On of my favorites. Hand size and built in rush make this vampire super reliable. Cycle your combat to draw your next action like a Founder or Deep Song. 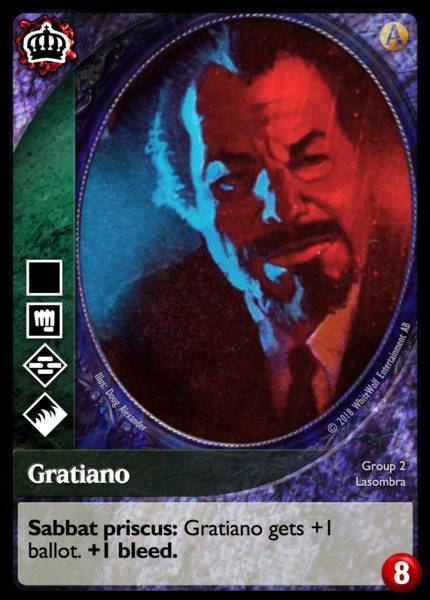 How many times did I have the problem with a rush deck, that I had all the cards to kill that pesky Giovanni, or Malkavian behind me, but I didn't have the rush. Obviously this is true for all vampire with d-rush built into them, but Nangila stands out for me, as she can be played together with Nana for 9 hand size, 2 master phase actions and a rush. Pretty strong for 2 vampires. I admit this isn't new from me either, as I played this deck this year already, but it fits the theme so well. This one is maybe my number one wish to build a deck around. Being able to one-shot Nephandi from the board is always nice, but basically what you are looking at is a wall deck that is able to remove 4 blood from the table / round with the help of Enkil's Cog. I haven't found the balance to fit all I want into a deck within 90 cards (maybe less), but what I am aiming for is to deteriorate the table with stuff like Narrow Minds, Young Blood, Ossian, Kamiri's ability as fast as possible and throw a Smiling Jack. This vampire came out a long time after I stopped playing, so I didn't have the chance to do so, yet. 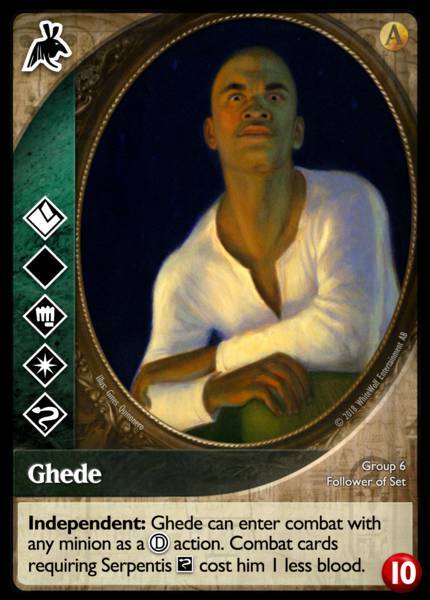 Ages ago I had a deck where I played way too many Vast Wealth cards to have one in my opening hand to put on Nakthorheb so I can fetch my Eye of Hazimel... well just play Ghede and I can finally put my Typhonic Beasts to work. Also note to myself: never ever play a rush deck again with no built in rush. I love reliability. That's it for today. I need to spend more time studying crypt cards and thinking of concepts I want to play. I hope you enjoyed this article. I will try my best to waste less time on online games and invest more time into v:tes so I can up with some quality articles for this blog. If you used to enjoy this blog when it was updated regularly or you are a new follower and wish to read new content regularly then please kindly leave a comment or just check one of those boxes below (funny, interesting, cool). Feedback like this is a huge driving force for me and will help me a lot to keep writing regularly which I really need as writing such articles is pretty time consuming (this one took 2 hours + the time and energy to even come up with an idea). As promised here is my tournament report. First of all let me say that I was very surprised about us ending up with 21 players! That is really good. As all my cards are still somewhere in the attic I went with the one deck I still had ready to play: Eze, The Demon Prince. It is a deck that is fun to play, doesn't generate much table hate the way I built it (no flashy Helicopter, Rutors Hand and what not multi actions, no aggressiveness early on) and play it and overall has never let me down. For a long time it was its last appearance though as I want to play so many different decks now. This was the kind of table you play vtes for! This was a four player table. I got to start with two transfers and got luck enough to draw a Dreams of the Sphinx in my opening hand. My prey played an Assamite mid cap combat deck with some auspex support and a decent amount of "wake" cards. My cross table buddy played the Gangrel antitribu Dual From deck that ended up winning the tournament. It was based on Aksinya and Una with Cardinal Benedictcumberbatch. My predator was the Setite bleed deck from table one. In all honesty I thought I will get nothing here. My combat defense against Psyche! is worthless and I can't stop 10 minions bleeding with stealth. But Fortuna decided to help my out with this one. The Assamite deck didn't want to right away kill my 11 cap with a stealth bleed behind me so I return that I don't pressure him he let me be and focused on his prey. Well guess my first Master card on my turn? Exactly! With Secure Haven on Eze I temporarily felt safe. I am not sure if I remember correctly, but I think I got Kduva's Mask in my hand and managed to equip it. Meanwhile my crossy started really well, with enough combat cards to defend him self and he got his dual form + cardinal benediction combo off. He was up to a good start. However nobody could stop my Setite predator from bloating and getting minion after minion.Thirty minutes in to the game it felt like all four of us have a good chance of winning this table as well as being on the edge to getting ousted. At a given point I had to call Political Stranglehold to stay alive, but this game the anti Gangrel 9 additional pool. This brought him close of getting out of control so I banished his vampire burning the Dual From to reset the balance. But on the other hand he brought back Una (or Aksinya, can't remember) with full blood, so he could protect him better. As we continued playing everybody kept degenerating in resourced, you know less blood on vampire, less pool until you met a point where you had to commit. The Gangrel-anti almost ousted the Setite. At this point with Nana in torpor (meanwhile the Assamite did attack me and Nana had a contract on her) and only Eze up I decided to steal the Setite's Jake Washington with Entrancement. This sealed his fate as really every chance to block, every piece of pool counted. It was obvious that the Gangrel-anti will get his VP. I managed to convince my prey to rescue Nana so I have a chance to defend. Remember this was a 4 player table, if the Gangrel anti gets me as well my predator has no chance for the game win anymore. So he rescued Nana and I used Jake to restore 4 blood on her. I figured my best chance was to let the VP's split and go for the one vs. one against the Assamite as he was really low on blood on his vampires. We agreed I let him in peace until he oust his prey so he only focuses forward and doesn't attack me. This happened within 2 turns. I was well prepared for the 1 vs 1. I had Enkil Cog ready, Banishment on his main vampire and I had a Sudden in my hand against his Pentex he tried to play on me. He managed to torporize Nana though and I got really short on pool. It was now or never and I had to go for a bleed of 5 with Eze in my turn. He didn't have an Archon Investigation, so I ousted him and finished this table with a Game Win with 2VP's. 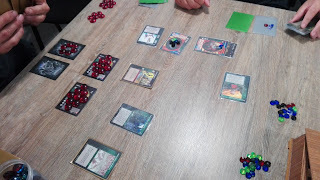 My prey was a Nephandus deck, cross table I had a big cap voter with Queen Anne and one of the new vampires, a Setite Prince , some advanced version of an older one. My predator was a Saulot deck with Neighbour John as support, who started with an early Ivory Bow. The Nephandus Deck had a very impressive start. Not only did he spa Nephandi he also had 2-3 Hexapeds and several vampires. Since neither his prey nor me could block his actions, oh and he started with a first turn Montreal as well. Being the threat he was my crossy offered a deal to oust him and my predator together and go for the 1v1. I was very happy with this so I gladly agreed. He called an Ancilla, but the Nephandus player had a Delaying Tactics. Next turn he didn't want to play it again as he rightfully realized that he had no real chance in a one vs. one against me anymore. I can totally understand that. My problem was that this version of Eze is opted against mid cap decks with all my Banishments. I only have one Ancilla in my deck and it never showed up despite having a Heart of Cheating out. The next 10-20 minutes was the usual passive degrading phase you see so often. Nobody wanted to commit too hard, but everybody was getting weaker, except for the Nephandi who became even more of a threat. The pressure was on my crossy. He decided to commit, but couldn't oust his prey due to another delaying tactics. I rescued him from Torpor to give him a chance and he actually did manage to survive the Nephandi's turn. And now comes the part I am still feeling bad about: he had little left in the tank and it was sure he would not have another turn. He tried to oust his prey again and we reached a point were he had 1 pool, 1 ready vampire with only 1 blood left. He considered going for the Ancilla again which would have killed his prey, himself and the Nephandus deck, meaning he gets one VP the Nephandi one and I get the Game Win with 2 VP's. 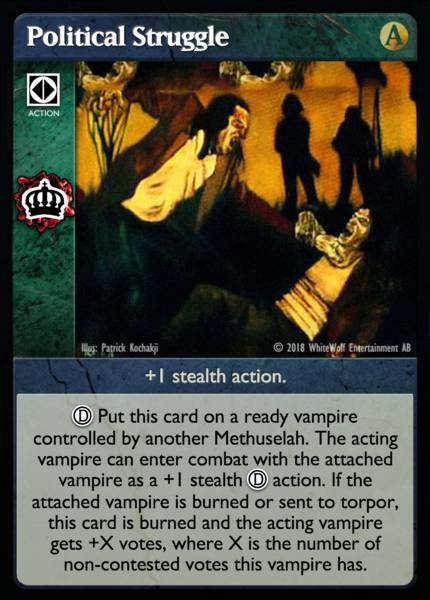 He already showed the card and tapped his vampire when the Nephandi sayed he should not give me the Game Win. He had no stealth in his hand anymore and Saulot was standing. He took back the card and went for a bleed with Govern hoping in a top-deck stealth to get his vp, which he didn't drew so he got nothing. My predator was so brought down though, that the Nephandi got a free 2 Vp's and faced me with +12 pool and a huge army bringing even more Nephandi out. Obviously I didn't stand a chance at all and the Nephandi took his sweep. It wouldn't have bothered me if the "King Maker" makes a call against me. What bothers me is making a call against me by also choosing the worse result for him self. He had to choose between him getting a VP and the table ending 1-0-2-1 or getting nothing and giving the Nephandi 1GW 4VP. The meta didn't fit my deck at all. Too many 11 caps, too many allies (Strange Day, Flaming Candle don't work, having many minions with 1 intercept from Unmasking hurt me a lot, no real Banishment targets as I can't banish 11 caps or whats the point is banishing 2-3 caps?) too many Psyche/Immortal Grapple decks. Pretty much sort of the worst meta for my deck. Despite this I managed to get 1GW 2.5 VP's all together after more than 3 years without playing a single game. So overall I am satisfied. I could have played much better on the first table. 2Vp's from there wold have been enough for the final. I could have gotten my ticket from the third table, but well it wasn't meant to be. Overall I had fun and I am looking forward to the next tournament. Congrats to Máté Vaka for winning with his stylish Gangrel-anti Dual cucumberbatch deck! GG well played! I didn't stay for the final as I was starving for food and I was already too tired. I hope next time I can make notes and report of a final as well. f.y.i. : there is now a tournament winning deck archive HUN TWDA on this site. It will feature only winning decks from Hungarian tournaments. Back to gaming and stuff regarding this blog. It's been a really long time since I last played v:tes. I mean years. This weekend though I attended a tournament in Budapest and it felt good to sit at the table again. As I had nothing else prepared I took my only deck I had available from years ago, but you will read about this later. I'll post a tournament report soon. But how comes I am back to v:tes? Well I'll give you guys a real short summary. Back then I used to be a bit burned out with v:tes and so I jumped on the LCG train with Netrunner. It didn't last too long and when FFG first announced that they are rotating out the core set and and the firts couple of data packs I was done with that. The packs came too frequently you buy all those cards and they really say you can't use them anymore? Well I can still make a Jyhad only deck and just have a shot at winning a v.tes tournament. Feel the difference. Later on I got stuck with online gaming. It was more convenient. You don't have to leave the house, can just casually do some games even when tired. Some games are really addictive. Also people I loved playing v:tes with also left the game. The game felt dead. However despite my girlfriend trying to push me into selling my cards I always resisted. I lost a lot of money by not selling my 3 Enkil Cogs, all the Mind Rapes and so on, but I knew that someday I will want to play again. I really knew that. Oh and I hovered my mouse so many times over the delete this blog button. I never managed to press it. I missed being among people. I got tired of sitting alone in front of my pc while my social life vanished over time. I missed the community. I think it was around last years October-November when I decided that I will indeed play again. As I was attending a bootcamp studying C#, SQL and all the front-end goodies I had to postpone my return to after I finish. Well that's as much of text as I am willing to write around midnight. I will write a tournament report maybe as soon as tomorrow. My other goals are to remove all non-vtes related posts from this blog to have it nice and clean and a v:tes only blog again. I also want to give it a fresh design. 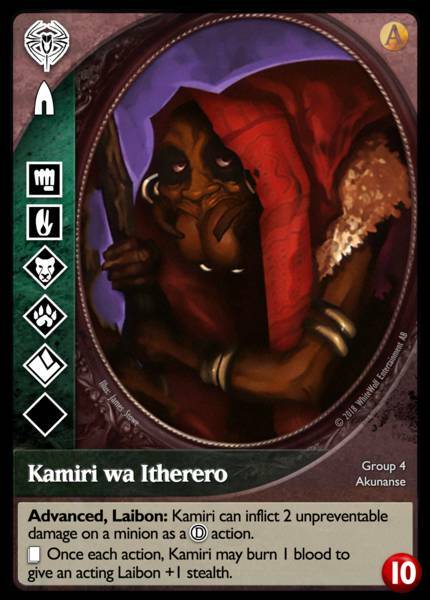 This deck idea is based on the Akunanse Kamiri wa Itherero (advanced). The idea is to exploit the following mechanic: play Jake Washington, destroy Jake with Ithereros ability to do 2 damage as an action -> play: Taking the Skin: Minion -> bleed twice. Use Enkil Cog as a perma bleed bonus + the option to bleed once more out of turn. This deck allows to be built toolboxy for great variety and fun. Play Absimiliard's Army. Whenever someone uses it make sure to play a Set's Curse on it. Use it yourself, but leave your own ghoul's as a target for Set's Curse at last.